This Robinson Crusoe review was made after playing the game six times. Robinson Crusoe: Adventures of the Cursed Island is a cooperative adventure game that shipwrecks players on a deserted island. Besides the more common survivor necessities (shelter, food, weapons), players will also learn through their decisions, and discoveries, that this island has many mysteries to throw at them. Robinson Crusoe was designed by Ignacy Trzewiczek and it’s published by Portal Games. There are many steps that go into setting up Robinson Crusoe: Adventures of the Cursed Island, but the most important one is choosing one of the six scenarios (seven scenarios in the newest edition). Each scenario plays quite differently and comes with its own set of objectives. 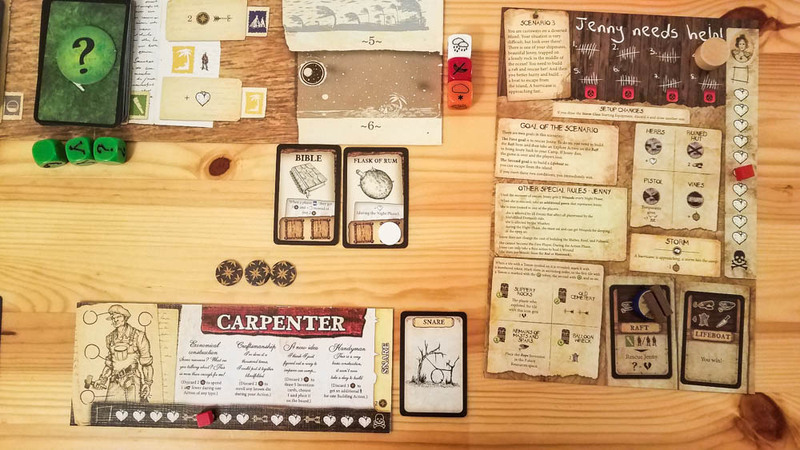 When getting ready to play Robinson Crusoe, players can choose to be the cook, the carpenter, the explorer or the soldier. Each character plays a bit differently since they have different morale/life tracks, special abilities and starting equipment. The team also has its own morale track that can make the game harder if it’s too low, or help players use their abilities if it is kept up. There are six basic phases in Robinson Crusoe: Event, Morale, Production, Action, Weather and Night. Three different sets of dice are used for each of the three actions in the game (building, gathering, and exploring). The dice will tell you if an action is successful (success, wound, or adventure) or not. We can’t go through this review without pointing out how important the Building action is. You have to build camps to avoid taking damage from the elements; you build up your weapon strength to be able to handle the animals that you encounter; and you have to build items to help you stay alive on the island. 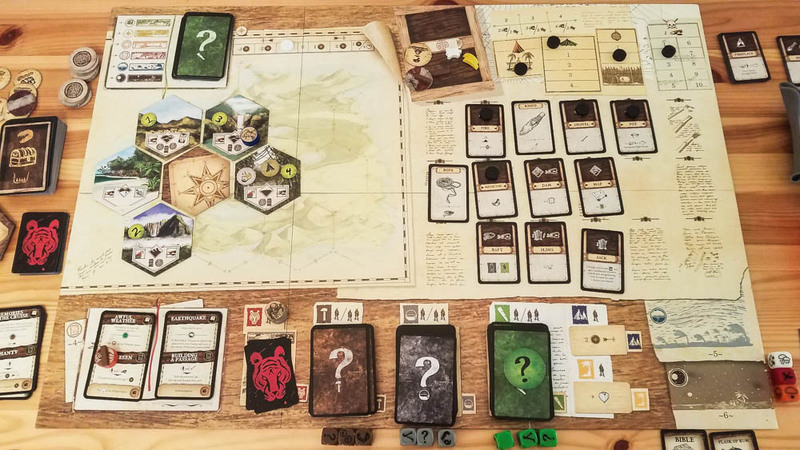 Players make their own choices while playing Robinson Crusoe, which makes the game unique and difficult to master. For example, one day you might choose to move to a different part of the island and fight a bear, while on another day you will focus on getting the team’s morale up. If one player succumbs to their wounds during the game, then the whole team has lost. You also lose when you are unable to complete your chosen scenario’s objectives in time. It’s incredible to me how thematic Robinson Crusoe is! It’s one of those edge-of-your-seat experiences that makes the 2-3 hours just fly by. Please let us know if you know of a more thematic game than this one because we definitely want to play it! I don’t think this game needed multiple scenarios, but it’s so awesome that it has them. Don’t worry, though, it’s easy to start a new scenario once you know the basic rules. You just have different objectives and a few rule changes. There is so much replay value in Robinson Crusoe since it is almost impossible to play the same game twice. Not only are there multiple scenarios to choose from, but the dice rolls and the decks of cards make it hard to predict what you will be facing. It really does tell a different story every time you play. The randomness of the dice and the cards just makes sense in this game. It works because this is an adventure game and in these scenarios you wouldn’t know what was right around the corner. You don’t know if you’re going to have to fight a big animal or if you will be able to get the supplies you’ll need to survive the night. Most people will love the way everything looks on and around the board once it’s all set up. It’s a bit intimidating, but it also makes it easy to throw yourself into the theme of the game. It’s very cool how the worker placement is implemented in Robinson Crusoe. You only have a few workers, but you can send them to a bunch of places on the board and perform the actions you need to help the team (hopefully) win. Building things is so fun and rewarding in this game! Each character feels quite different. They all have multiple unique special abilities that help players to know what they should be looking out for throughout the game. The soldier is good at hunting, the carpenter is good at creating and fixing things, etc. This game is very tough. That’s going to turn some people away, but my group loves tougher co-ops. I don’t know if Robinson Crusoe is as difficult as Ghost Stories, but losses definitely hit you harder since games are so much longer and you put so much effort into them. It might not be the best choice if you are new to cooperative board games, but Robinson Crusoe is a wildly entertaining game for those that give themselves some time to become familiar with it. It’s actually my group’s favorite co-op board game right now, so that should tell you how much we like it. Anyone who likes the adventure genre should love what this game offers. You really do feel like you’re on a mysterious island and everyone has to work together in order to survive. This makes Robinson Crusoe a great deal of fun and certainly a game that you should consider adding to your collection. I never knew I needed a Robinson Crusoe board game in my life, but I am very glad that I randomly decided to give this one a try a few years ago! Update: Added images from the newest version of the game and updated all links. Thanks for taking the time to read our Robinson Crusoe board game review! To stay updated on all things cooperative board games, follow us on Twitter, Facebook, or via RSS.